This is the 4th Revised edition of this popular book. This book covers 892 medicines and is made up of rubrics of the mind mostly from the Synthetic Repertory Vol I, with additions from other sources. With numerous corrections and elucidations of the original texts, it is a more comprehensive, more authentic, more accurate and more elucidated compilation than any other work of its kind. It will prove to be an invaluable book of reference. This is a classical text written by the late Dr. HL Chitkara who was one of the stalwarts of Homeopathy. He was one of the key persons who worked on prescribing only on the basis of mind Symptoms. The book has compilation of rubrics of 892 remedies from Synthetic Repertory and few other sources (marked with asterix). 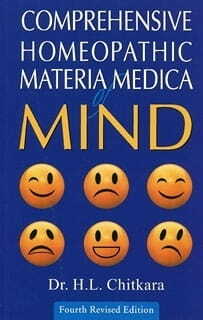 This is an exclusive work of its kind by which one can understand the link between Materia Medica and Repertory. There are so many rubrics, which we are unaware of, with this book all such rubrics come to light. Similarly there are so many remedies for a rubric, which we don't think about in our day-to-day practice, which are revealed in this book. This compilation is more comprehensive, more authentic, more accurate and more elucidate than any other work of this kind done to date.